Refrigerated containers, also known as ‘reefers’ are 40 or 20ft shipping containers that are used to transport temperature sensitive cargo. They are intermodal, which means that they can be carried by road, rail or sea. 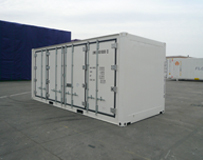 Refrigerated containers have integral refrigeration units which rely on an external power supply. Whilst in transit, this is taken from the ship or train or, in the case of a lorry trailer, by a diesel powered generator (gen set) attached to it. Our containers used for static storage, however, require an external power source in the form of either 380 VAC, 3 Phase, 50Hz or 440 VAC, 3 Phase, 60 Hz. Some have dual power systems and can operate with 180 VAC, 3 Phase, 50 Hz or 220 VAC, 3 Phase, 60 Hz. These are fitted with two supply leads enabling them to work on either system. Power consumption is in the range 5.8 kW – 11 kW dependent upon container size, ambient temperature, temperature settings, stowage plans and other factors. Refrigerated shipping containers are available to buy or for rent from ConRail and may be specified with a wide range of options, according to your needs.